Rocco Rossi was the first in line to file his papers to run for mayor of Toronto. In his subsequent press conference, he billed himself as the "big, bald" mayoral candidate who wanted to cut the mayor's salary and sell off Toronto Hydro. 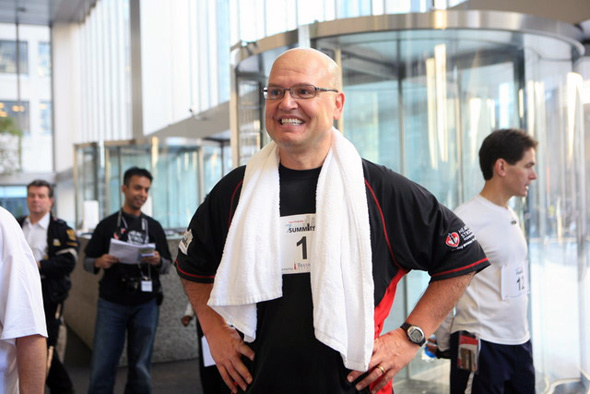 Despite the splashy debut, many Torontonians don't know much about the east end-raised Rossi, who once kayaked 490 km from Toronto to Ottawa to raise money for the Heart and Stroke Foundation, of which he was formerly the CEO. Here he takes me through what parts of the city he once lived in, his favourite parts of the city, and, of course, what he would do for the city of Toronto. I grew up in East York/Scarborough near Main and Danforth, and then later my family and I moved out to Birchmount and St. Clair in Scarborough. When I got married, my wife and I had our first apartment at Bathurst and St. Clair before we bought our first home on the Danforth near Logan. Today we live near Yonge and St. Clair. Growing up my real escape was Taylor Creek Park and everywhere from Crescent Town on Dawes to Edwards Gardens. I've walked and biked and jogged every trail. That, to me, is one of the joys of Toronto: it has the most amazing ravine and park system of any major city of the world, and we take that for granted. Another favourite place for me is Palmerston Blvd. I loved going with my parents to College St. so that we could shop in Little Italy. We often would walk up Palmerston and look at the fabulous houses and the unique lights along the street, which I have a particular soft spot for. I love the trails up the Humber. And I also love to kayak, so I'm often out on the water, going down the Humber to the Islands...just paddling on Lake Ontario. When I spoke to Mayor Miller, he said that none of the potential candidates had answered the question "Why?" Why are you running for mayor? This city has given me and my family a lifetime of progressively better tomorrows, and I want to make sure that this continues to be the case for others, whether your came here a 100 years ago or a 100 days ago. You said in your first press conference that you want to build bridges. With who? We amalgamated over a decade ago, and we've never integrated the city. I want to build bridges to former boroughs. I want to build bridges to the business community. I want to build bridges to the ethno-cultural communities. And I want to build bridges to the region, both from the standpoint of transportation and economic development. Very often people are told there's apathy. I don't find apathy as I travel from one corner of the city to another. I see excited passionate Torontonians whose only problem is that city hall isn't seen as a partner; it's actually seen as a detriment. This is a great city in spite of city hall -- not because of it...and we could be even better if we had real partnerships, if we really built bridges to all of these communities. What can Torontonians expect if you're elected? They can expect clarity; they can expect a focus on the basics so that we get back on track from a financial standpoint...from a transit and transportation standpoint, and so that we put economic development at the centre of our agenda. We want to provide the kind of opportunities that lead to the social mobility that wave after wave of immigrant group has been able to take advantage of, but which has been slowing in recent years. Everyone is my competition. The great thing about hotly contested elections is that they force people to be clear on the issues. I'm the only one of the major candidates who is not a career politician. I'm an outsider trying to bring a new perspective to city hall. If Torontonians are generous enough to elect me as the mayor then I would be the first one since [William Lyon Mackenzie] not to have been a councilor. Do you pay attention to the polls, or is it too early? It's really early. All the polls indicate at this stage is name recognition, and frankly I'm thrilled at the first poll because again, as the only non-career politician, it's encouraging that I'm at 15% already. Very few people know me, and my hope is that it's not about me, but about the issues that I'll bring to the table...that it'll be about clarity and not the 'same old, same old' that's put us into the mess that we're in. What would you like the readers of blogTO to know about you? I'm someone who has a broad business background, who's run a family business, who's run publicly traded companies, and one of Canada's largest charities (the Heart and Stroke Foundation of Ontario). I've always left an organization stronger than when I went in by focusing on delivering on key priorities. I'm the child of immigrants in a city of immigrants. I love people, I love the city, and I truly believe that we just need to fix a few key things to unlock the even greater potential that exists here. Photos by HiMY SYeD / photopia and heartandstroke of Flickr.